SYSTEM is a tab inside settings menu, which allows you to get an overview of CPU usage, usage of RAM memory ( inside this section we can see actual available, used and free memory) And about free space at myPRO device. We can also see there processes (on the right side). If any of these processes are red, please wait a bit, if process won’t refresh, please restart myPRO device. If the problem still persists, please contact our technical support at https://store.myscada.org/page/new-ticket. 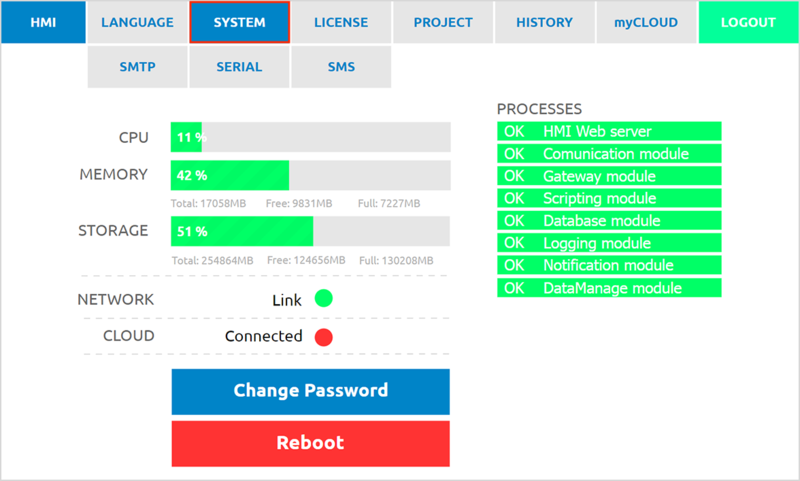 Inside SYSTEM tab, we can also see connection to local network as well as the connection to myCLOUD service. Green color indicates that everything is correct or that the device is connected successfully, but the red color indicates something is wrong or that device is not connected.